Reduces Trigger Pull, Improves Accuracy! Our High Performance Safety Plunger is machined so that surface area is slightly rounded to provide less friction than the factory part. This reduces the drag of the trigger bar as it glides over the the safety plunger when you pull the trigger and reduces the effort needed to pull the trigger. It's coated with Titanium Nitride which has a very low coefficient of friction which further reduces the drag of the trigger bar. 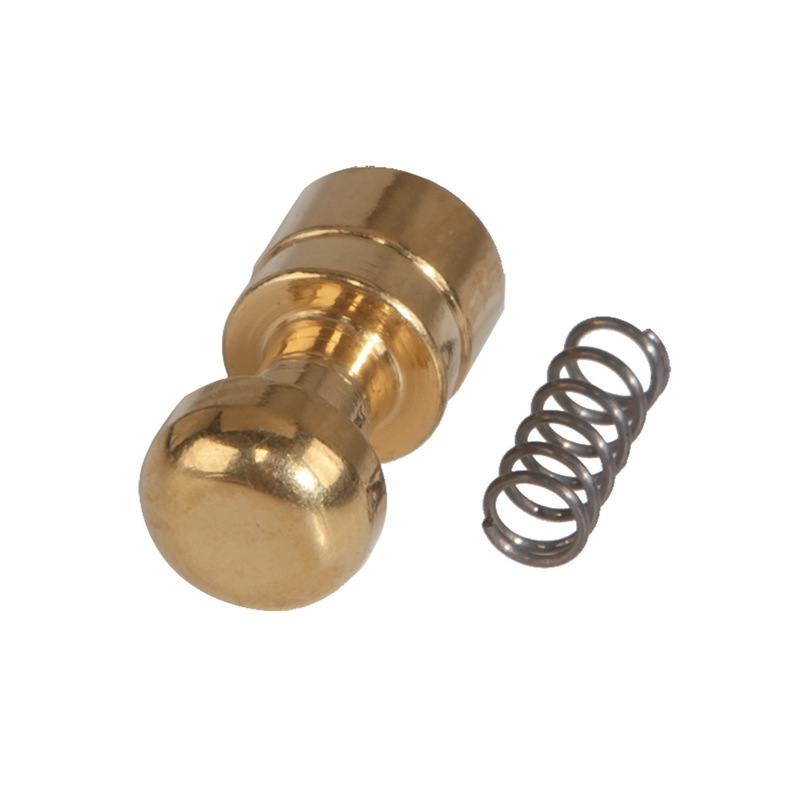 A reduced power spring is also included with your purchase! Easy installation - watch the video above! This high performance replacement Safety Plunger helps provide a smoother, lighter trigger pull and, hence, better accuracy! The surface area has been slightly rounded and the part is machined from a solid billet of heat-treated 417 steel. That reduces the friction of the trigger bar as it glides over the the safety plunger when you pull the trigger and reduces the effort needed to pull the trigger. That's what gives you better accuracy. Because there is less friction on the metal to metal parts....the trigger pull is lighter! Safety Plunger will fit most Glock handguns including the new Gen4 Glocks. It is a universal part with only one selection based on the caliber of the Glock. Now Available for the Glock 43! This part DOES NOT fit Glock 42 or Gen 5 Glocks. 9mm, .40, .357 and 10mm all use the Small Safety Plunger, While .45 caliber Glocks use the Large Safety Plunger. Please use the Select Gun option above to select your gun model. Comes complete with a reduced power replacement spring. I replaced it along with other springs and trigger connector rod, firing pin etc. It went in fine fit correctly and worked. It has a durable metal coating so should last at least another 25 yrs for me. If you want to adjust your trigger feel without buying a new trigger, then look no further. This part totally transformed how smooth my trigger pulled. Worth every bit of the money! At first everything went great and I loved this part, you really can feel how smooth it makes it. After about 2000 rounds it looks like the extractor starts to chew it up where it meets and started causing light strikes. First thought was to put in the factory spring as I was running the 3lb spring. It helped but I still had some light strikes, and that's when I noticed the chewed up safety plunger. Put the stock plunger back in with the 3lb spring and now it's great. DOES NOT fit the 19X - it has a rectangular safety plunger. I don't own any other Gen5 Glocks - but I suspect it would not fit them either. The one I ordered for my Gen3 21, though, works like a champ so far.